Application Insights (AI) released the telemetry processor feature that enables you to inspect, filter and modify each data point generated by the AI SDK before it is sent to the portal. I’ve been playing with this capability and realized that it gives you a programmatic solution for identifying your application’s remote dependencies at runtime. This enabled me to implement a custom extension that performs network diagnostic tests against my application’s dependencies. The resulting data extends and complements AI’s default telemetry. The flexibility and richness of the telemetry processor enables many scenarios but digging in on network health is what initially jumped out to me. This post shares what I’ve learned from the project. I created a simple ASP.NET project that has a single remote HTTP dependency to fetch historical stock values. The application is instrumented with the AI SDK and implements a “ping mesh” telemetry processor extension that inspects AI remote-dependency-data (RDD) events, parses the distinct URIs, and performs an ongoing series of TCP port pings. The diagnostics results are then submitted as AI metrics that help isolate if a remote dependency slowdown is network related or not. The value of this telemetry is how it helps to either implicate the network for slowdowns/failures or to clarify that the issue is higher up that stack. 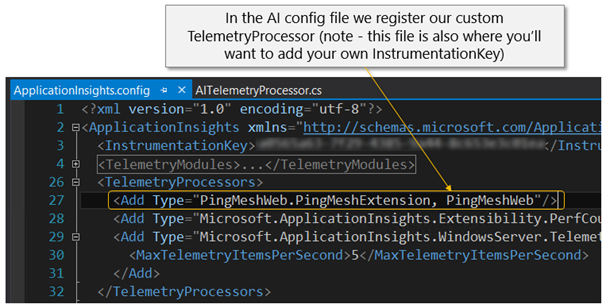 Illustrate how you can register a custom AI telemetry processor extension and then process individual AI telemetry events. Show how AI’s remote dependency telemetry events can be used to dynamically identify your applications dependencies at runtime. Demonstrate how you can integrate custom code within the AI SDK to evaluate network health and performance for your dependencies. Show how to log custom telemetry to your AI application. Your application code makes calls to remote dependencies. The AI SDK intercepts each remote calls and sends a remote dependency event to the telemetry processor extension you registered. 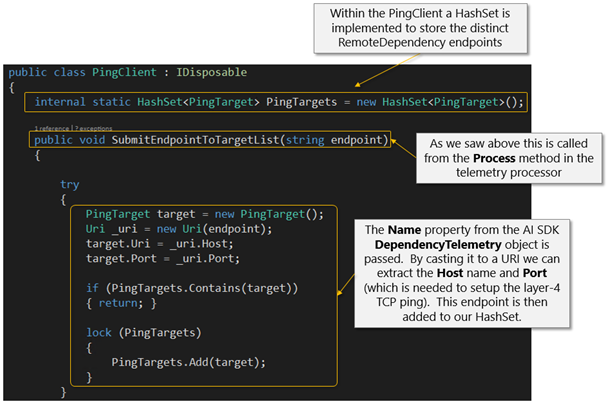 The endpoint properties (host-name and port) are parsed from the remote dependency event and stored in a static hash table within the Ping Mesh object. 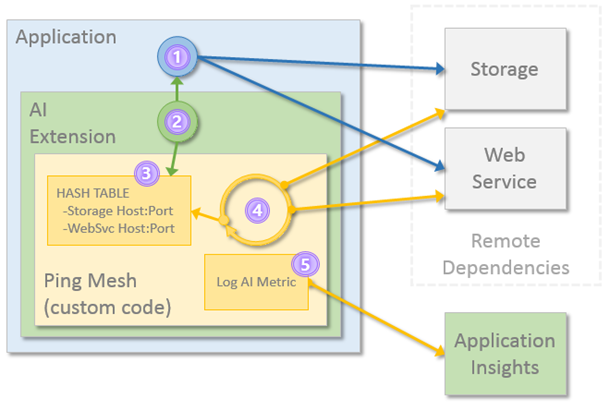 The Ping Mesh object continually polls the hash table and then creates ‘Ping’ threads that evaluate network health and performance for the endpoint. As each Ping thread completes it submits AI metrics for network health and response time. Further improvements could be added to capture client side network state (e.g. – netstat, tracert, ipconfig, etc.) at time of failure and submit those to AI as Trace events (SDK guidance here). AI’s remote dependency telemetry provides you with free insights into the overall health and performance of calls into your remote end-point (i.e. – It gives you the blue line). With a bit of custom code implemented as an AI Telemetry Processor extension you can generate your own network health and performance metrics (i.e. – the orange line). So, with a little bit of custom code I was able to extend to AI telemetry to give me ongoing network diagnostics that are dynamically spun up as my application connects to new endpoints. That is pretty cool! Instrument my application with latest AI SDK and setup an application within AI (right clicking on your VS project and a wizard steps you through the process). Add a reference in my project for the custom ping mesh library that implements the network diagnostics. 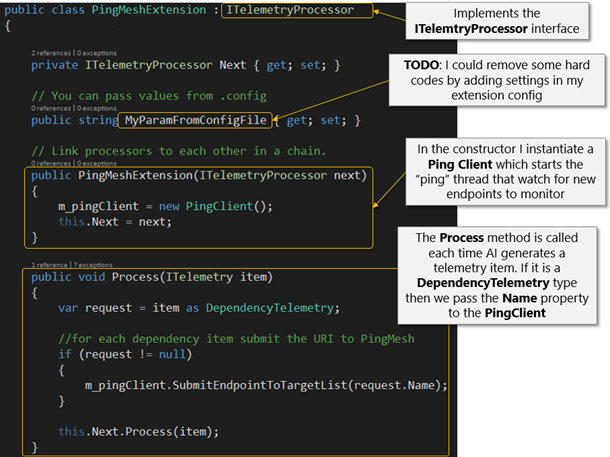 Add code for my telemetry processor (AITelemetryProcessor.cs) and instantiate the PingMesh object in its constructor. 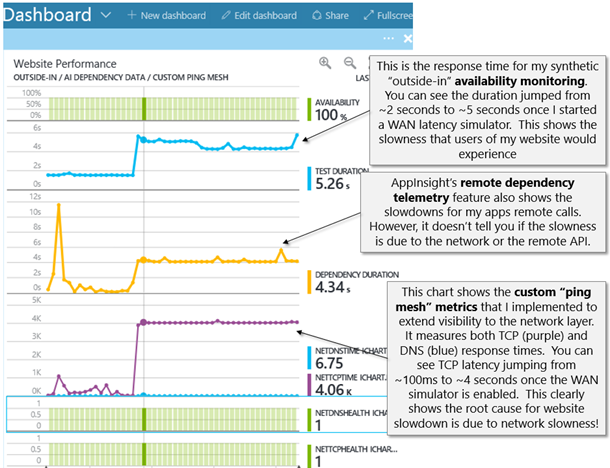 Update the ApplicationInsights.config with the configuration for the telemetry processor. Build and run my project. 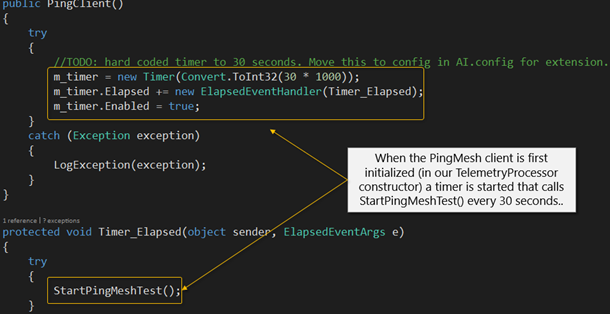 As mentioned earlier, a “ping” thread is created when the Ping Client object is initialized. This ping thread executes every 30 seconds (I should move this setting into my extension config but have hard coded for this demo) and, as we’ll see, polls any endpoints added to the PingTarget hash set above. In this post we looked at how you can author code that plugs into AI Telemetry Processor pipeline to extend the default analytics provided by AI. In our example we leveraged the remote dependency discovery that AI performs to implement diagnostics that provide a historical baseline for your network health. You could extend this implementation further to capture network state on you operating system when issues occur. Hopefully this gives you an idea of how flexible and powerful the AI telemetry processor feature is.